​the doors of Harlem's hottest nightclub, 'The Cotton Club'! ‘Swinging at The Cotton Club’ is the action-packed show celebrating the music and dance of The Cotton Club – New York’s most celebrated nightclub of the 1920s and ‘30s. Featuring spectacular dance from the Lindy Hop Dance Company and their featured tap-dancer, alongside authentic music and vocals from the 10-piece orchestra - this is a truly unique evening of world-class entertainment. Perhaps the world's most celebrated night club and music venue, The Cotton Club would have seen performances by some the most iconic names of the era. Duke Ellington, Louis Armstrong, Cab Calloway, Billie Holiday, Ella Fitzgerald, and Fats Waller would have had the club swinging - whilst dancers such as Bojangles Robinson and the Nicholas Brothers lit-up the stage with their breathtaking routines. 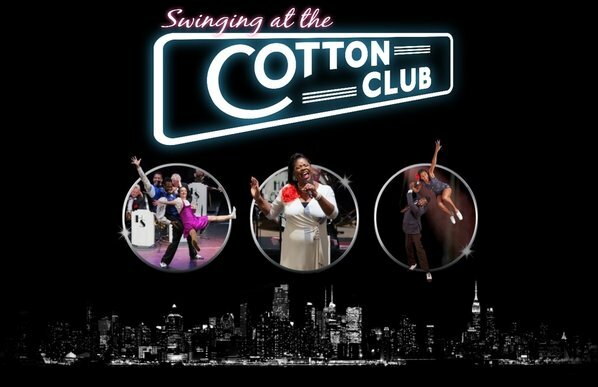 In this show, the exhilarating dance and music of the Cotton Club is recreated by the fabulous Lindy Hop Dance Company alongside The Harry Strutters Hot Rhythm Orchestra. Also featuring American vocalist Marlene Hill and compere/vocalist Megs Etherington. The Lindy Hop Dance Company are the UK’s finest authentic jazz dance company. They are perhaps best known for their spectacular and breathtaking performances of the Lindy Hop – the original form of jive dancing that developed in Harlem in the late 1920’s. However, their talent and versatility is also expressed in the range of dances they perform all influenced by the authentic jazz dance tradition. The dance company’s personnel are drawn from the very best of the UK's dance talent, with its members having performed across the UK, Europe and beyond including at events such as The London Olympics Opening Ceremony, New York's Lincoln Centre Out of Doors Festival, as well as with shows including 'Riverdance' and dance companies such as 'Diversity'. The Harry Strutters Hot Rhythm Orchestra are one of Europe's finest exponents of the hot dance music of the 1920s and 1930s with characteristics drive and visual appeal. The Orchestra has toured extensively in Britain, Europe and Scandinavia and claims the title of ‘Europe’s Hottest Jazz Orchestra’. Using its own special arrangements of familiar as well as the less well known numbers from the repertoires of the bands and orchestra's of the period, the Orchestra has extensive experience of a wide variety of venues and events, appearing at numerous Festivals, Concerts and TV programmes across Europe. ​Just a selection of the music that will be featured in show includes: Minnie The Moocher; C Jam Blues; The Charleston; Drum Crazy; Black Beauty; Everybody Loves My Baby; That Lindy Hop; Jubilee Stomp; It Don’t Mean A Thing If Ain’t Got That Swing … and much, much more.